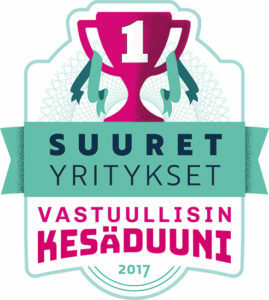 The Responsible Summer Job campaign has again rewarded the most responsible summer job employers in Finland. Housing investment company Kojamo plc was the winner of the major employer category. A total of 128 employers participated in the Responsible Summer Job 2017 competition, and responses were provided by 6,000 summer workers. Summer workers evaluated their employers on the basis of the application process, orientation training, meaningful tasks and equality, among other things. The jury mentions in the reasons for awarding the first place to Kojamo that Kojamo’s summer workers evaluated almost all of the areas to be excellently implemented. The application process and meaningful tasks offered by Kojamo are among the best in the major employer category. In addition, the extremely high level of overall satisfaction must be taken into account. “The best thing about this summer job is that I’m always in a good mood coming to work in the morning. The atmosphere and colleagues are great. I have been given responsibility in my tasks,” says summer worker Martina Fernström who works as a secretary. “Many of our summer workers apply for a job again the following summers, and we also recruit summer workers into permanent employment relationships. We have many employees who started out as summer workers and became enthusiastic about the industry,” says Anu Nurro, HR Manager at Kojamo. At Kojamo, summer workers innovate and come up with ideas about new operating methods with which we develop our operations and improve our daily ways of working. The summer workers were extremely thankful that the company wanted to hear their ideas and voice. The summer employees also identified other strengths of Kojamo to be the amazing colleagues and supervisors, positivity in the units, an extensive orientation, meaningful and diverse tasks and different benefits provided by the group. “Summer workers are indispensable for keeping daily operations running, but they are also such an innovative bunch full of energy. I would also like to thank our personnel who guide the summer workers in their jobs and provide comprehensive orientation. We are always happy to receive summer workers,” says Nurro. This summer, Kojamo hired approximately 50 summer workers in Helsinki and eight other Lumo-kotikeskus locations around Finland. The summer workers were given the chance to work in functions such as sales, house management, technical management, customer service, office services, accounts payable, rental control, financing, accounting, marketing and HR. Kojamo plc focuses on real estate investments in Finland, renewing rental housing in order to make it increasingly attractive. The vision of the housing investment company is to be a pioneer in housing and the number-one choice for customers.